Permission to publish my code submitted for the project assignment was granted by the professor. This is a very simple console application that I completed for a class assignment. It is shown here to illustrate my coding style, structure, and commenting. This example is considered Level 1 – Easy. The application displays temperature conversion tables. To work with methods having parameters and a return type. The program displays a list of temperatures in Celsius degrees converted to Fahrenheit and vice versa. A menu is provided for the user to choose the type of conversion: The menu repeats until the user chooses 0 to exit. 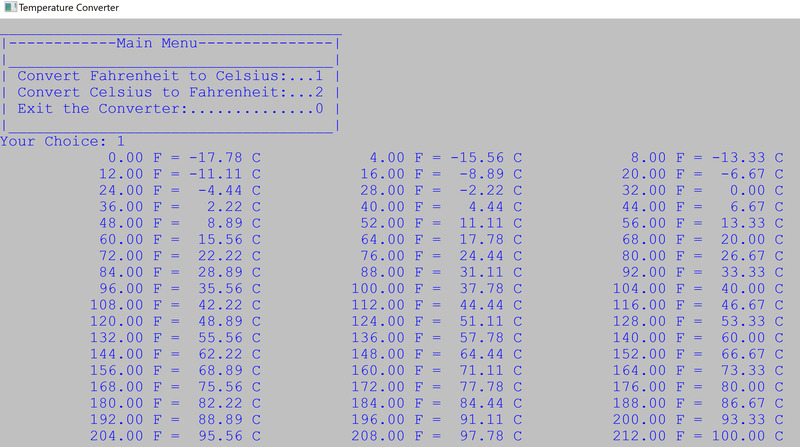 When option 1 is chosen, the program calculates and displays a list of values between 0 and 212 degrees in Fahrenheit converted to Celsius degrees as shown in the next image. 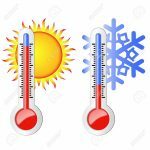 When option 2 is selected, the program lists values from 0 to 100 Celsius converted to Fahrenheit degrees. You can also download a zip archive of the project code here.